Using just a couple hours in the dark Tuesday night to plow and shovel the 9 inches of snow we received, left the overall job of cleaning up around here far from complete. I spent yesterday at the day-job again, arriving home with no interest in rushing out again to do the rest of the plowing or shoveling, so plenty of spots remain covered. 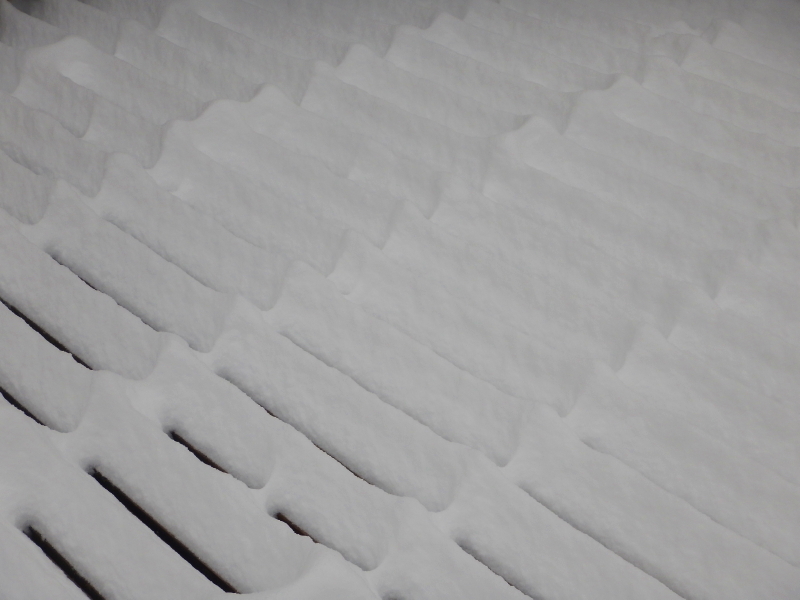 The deck ended up with a fascinating snowscape of waves and lines unlike anything I remember seeing before. We have ended up with a variety of interesting patterns over the years, but never one with peaks so tall while the slots between remained wide open. 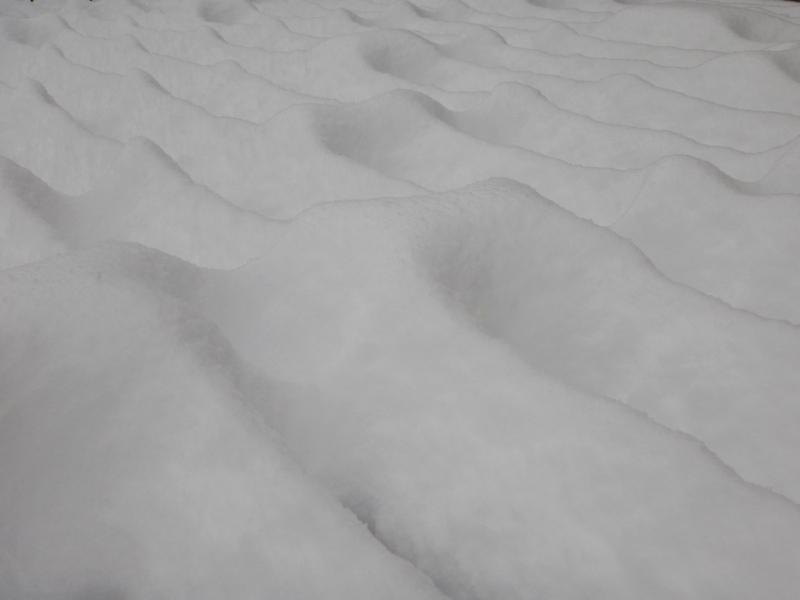 It must have been the result of a perfect dryness of the flakes and lack of wind while they fell. The pending challenge which we are very curious to have revealed, is whether the predicted next wave of snow will double what already fell Tuesday, and make our job of clearing paths and trails –and the back deck– even more challenging that it was already going to be. Last night, Cyndie and I watched a rented sci-fi thriller, “Life” (2017), a movie that depicts a space station crew studying a one-celled life form picked up on Mars that unexpectedly grows into a threatening menace. At one point in the movie, the lead scientist ponders the terrorizing underway by the organism they had named, “Calvin”. While out in the snow last night, under a “downpour” of more freshly falling flakes, I realized I was feeling a similar sense about the multiple blasts of winter weather battering us of late. My mind tends to perceive the storms as having cognition and intentionally pummeling our region with increasing levels of abuse. But the weather doesn’t hate us. It is just an unemotional result of ingredients playing out on a global scale. Somewhere, a butterfly flapped its wings and we got walloped by winter. Still, I can’t deny the distinct impression that, even though the weather might not hate us, it’s behaving an awful lot like it’s a little bit mad at us right now. I’ve read the book. Now, I’ve seen the movie. Last night, Cyndie and I went to see, “Neither Wolf Nor Dog” at a theater in Red Wing. I think the movie is a good adaptation of the book. In my opinion, the subject makes for a better book than a movie, but as a film, it works. Hats off to Steven Lewis Simpson for directing, and to him and Kent Nerburn for reworking the novel into a script for a film. Mostly, bravo to actors Dave Bald Eagle, Christopher Sweeney, and Richard Ray Whitman for their portrayal of the lead characters. The story lays bare the too often discounted or forgotten injustices heaped upon generations of the first nations people. It puts a glaring spotlight on the hypocrisy of opinions about the righteousness of the efforts to form this country by enacting atrocities against the native people already living on the land. This movie provided me with a fresh view of another perspective, and I found it very humbling and rewarding. For the second time in two weeks, I was out late on a Monday night. Last week it was for my first chance to see a Twins game in their outdoor ball park. 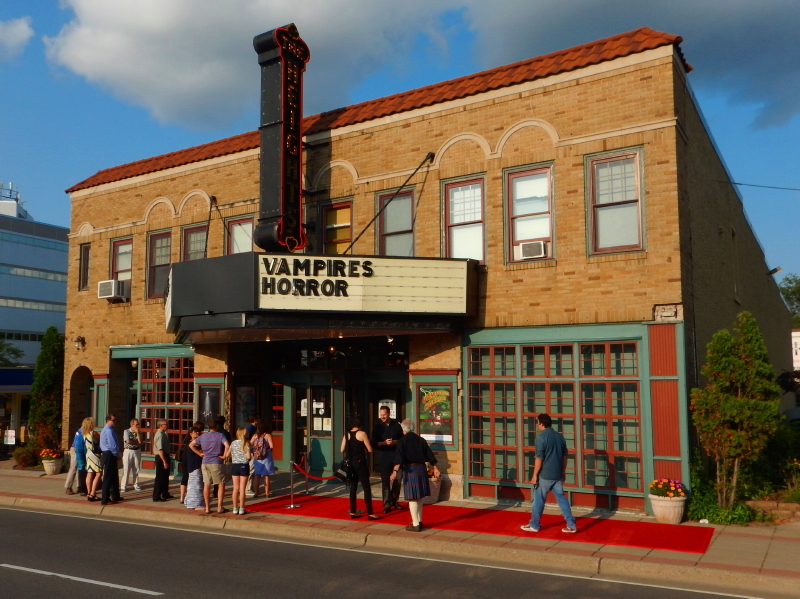 This week, I was in Columbia Heights for the premier showing of the movie “Vampires! Horror!” for which my nephew, Beau Hays, wrote the screenplay & lyrics. He also performed an acting role, along with his wife, Katy. It is a perfectly campy musical laugh riot. I truly hope they find a way to reach the audience for whom this flick will resonate. …It worked for Rocky Horror Picture Show! The premier event, complete with a red carpet, was held at the Heights theater, so it meant another drive to the big city for me. Cyndie met me there, since it is close to her work at Anoka/Hennepin school district. I found my brother, Elliott, and his family right as I arrived to park my car. My daughter, Elysa, and her friend, Anne, joined us in the nick of time before the start. 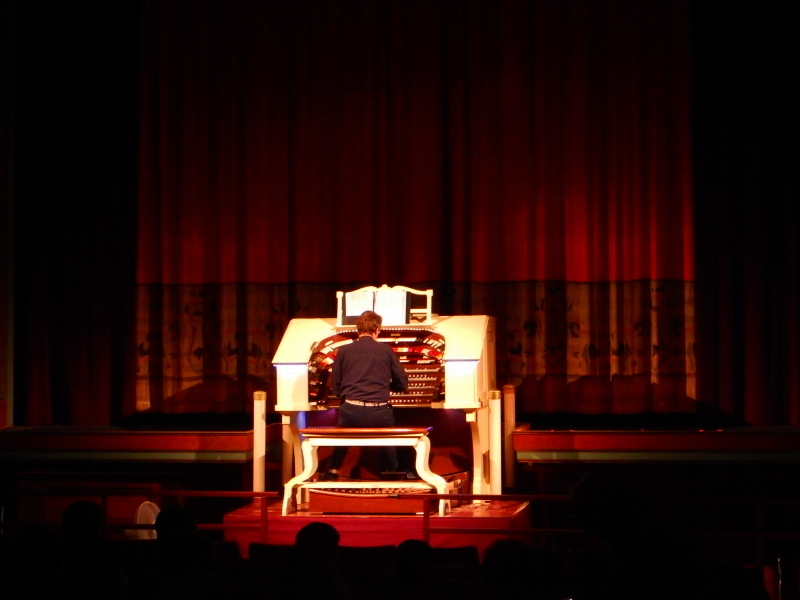 The theater has a wonderful pipe organ that provided a half hour of entertainment before show time. The seats were mostly filled, which made for a very festive atmosphere. Since it was the premier showing, many in attendance had something to do with the making of the film, a lot of them as extras. It produced a lot of laughter and applause throughout. 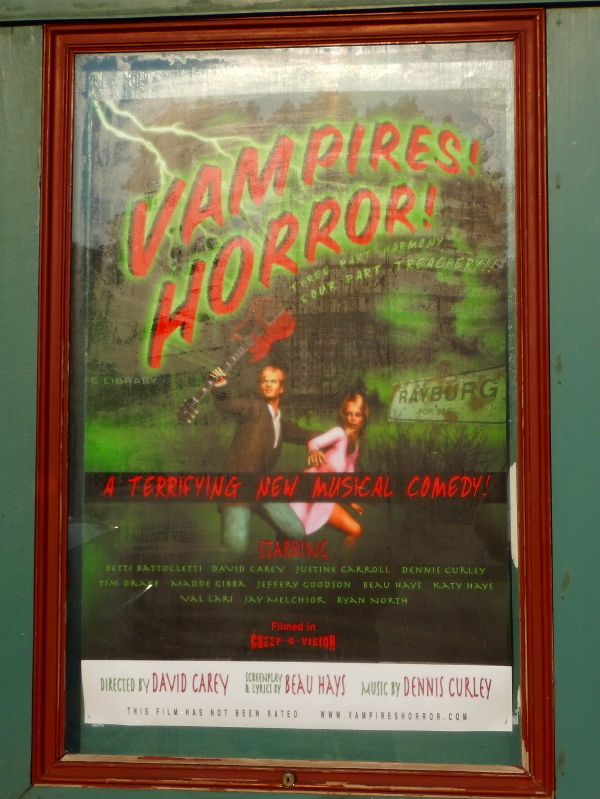 It’s a ghastly extravaganza of singing and dancing with wonderful character actors in a hilariously kitschy production. What’s not to love? Tagged with family, Heights Theater, movie, movie premier, musical, Vampires! Horror!